As every Apple fanboy is aware, there's a great wall separating those products from the rest of the pack - which is great for security reasons - but a real headache when syncing data between Mac and Android as there are no built-in solutions that can connect and transfer data between these devices. SyncMate by Eltima Software is a nifty tool that tends to fill this gap and give you full access to data synchronization between Mac, iOS and Android, irrespective of phone model, as long as it runs Android 4.x up. While most Mac users hate to depend on iTunes to sync their iPhone/iPod contents, as the huddle of syncing data between those device with Mac is really annoying, SyncMate comes to the rescue and there's no need to purchase several sync solutions in order to sync your Mac with each device - just download SyncMate and all supported devices will be synced within the one application. How easy is Syncing data with SyncMate? 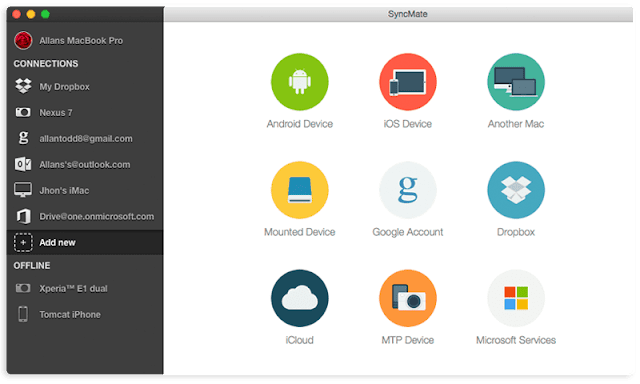 SyncMate offers a simple drag & drop, one-stop solution to synchronizing data on multiple devices, including iOS and Android with Mac, or even other Mac computers, and virtually mounted cloud storage services like Dropbox, Google Drive, etc., MTP devices and much more. 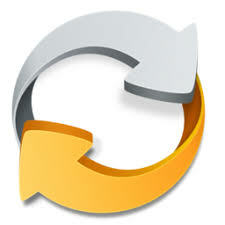 SyncMate can serve as an Android file transfer alternative for Mac, with Android devices mounted as Mac disks that facilitate browsing its contents as if it were any local disk. The UI is pretty intuitive and quite capable of syncing SMS messages, calendars, reminders, contacts, bookmarks from Safari, iTunes, & iPhoto. Additional functionality is that it brings the ability to delete all contacts, calendar events, to-do’s that is on an iOS device or another Mac computer. Either via Bluetooth, Wi-Fi or USB, you can read, create, send, or delete Android messages via Mac. SyncMate can get more done with the Expert edition (a premium version of SyncMate) which costs only $39.95 on the Mac app store. The premium version offers additional features like: ability to mount device as a disk and backup data & much more. But best of all, SyncMate is an easy-to-use software for all user groups, including Amateurs as it offers a hassle-free, quick solution to syncing data across multiple devices with Mac computers.